Aloha! Welcome to our oceanfront condo at the Lae Nani Resort in beautiful Wailula, Kapaa, Kauai. Surrounded by lush tropical landscaping and the sound of ocean waves, you will immediately realize why the ancient Hawaiians built a sacred temple or Heiau at the very tip of this property. Our third floor oceanfront condo has white-water ocean views and directly overlooks the Heiau. Enjoy your morning coffee in our spacious balcony lanai as you watch spectacular sunrises. Go for an early morning swim in the huge resort pool. Spend the day at the public beach directly behind the property and Papaloa Cove – you’re only a few steps away. Our beach has a natural lava rock ocean pool that is ideal for children and non-swimmers. You can swim, surf, kayak and even fish along this public beach. And don’t be surprised to see a Hawaiian Monk seal napping under the Papaloa Cove sun every now and then. 'Working holiday'? This is the place for you. We provide free wireless internet and free long distance calls to anywhere in the U.S. Located on the popular “Coconut Coast” we are walking distance to the Coconut Grove shopping center which boasts many shops and boutiques, art galleries, and fine & casual restaurants. Rather eat a home? Our condo has a fully equipped kitchen. Or, use the gas BBQ grills located next to the pool and eat your dinner in the balcony lanai and enjoy the glorious twilight. The Lae Nani Resort also has a inviting swimming pool and a tennis court which can also accommodate pickle ball. For your convenience, a large, on-site, coin-operated laundryroom is also available for guests. Centrally located to many island points of interests, the Lae Nani Resort is only 10 minutes from Lihue International Airport and 2 miles from Kapaa. It is midway between the Kauai North Shore (Princeville, Hanalei, hiking entry to the Napali Coast) and the South Shore towns of Old Koloa Town and Poipu. A little further a field you will find Waimea Canyon, the Grand Canyon of the Pacific. Nearby outdoor activities are numerous. Like to golf? An inexpensive public course is located a short 5 miles away and a championship golf course only 10 minutes away. Want to go kayaking or canoeing? Navigate the Wailua River only ½ mile away. You can also take a Wailua River boat tour which can take you all the way into the famed Fern Grotto. Want to learn to surf, kite surf or paddle surf? Equipment can be rented down the block. 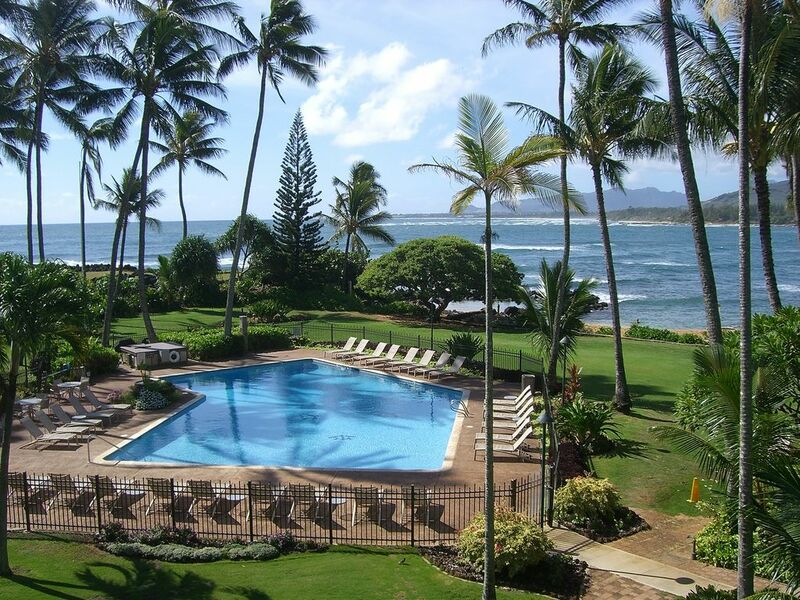 We know you will love your stay in our condo in the beautiful Garden Island of Kauai. This is your opportunity to book directly with the owner at a very reduced rate. Mahalo and we look forward to welcoming you! Coin laundry room on site. Just step off the plane and live aloha! This was our first time visiting Kauai and this unit in Lae Nani was the perfect place for us! An easy 10 mins drive away from the airport meant just stepping off the plane and living aloha! The big lanai opens onto the very well maintained grounds, lovely pool and ocean literally steps away. Super friendly and quiet complex. The proximity to the heiau makes this very special. The unit itself is so clean with an open layout and kitchen stocked with all basics. Using the bbq’s available on the grounds was also a great way to socialize with others. There is no air conditioning but we actually prefer to just open the windows, use the ceiling fans (which we didn’t even use most of the time) and enjoy the tropical trade winds and hear the ocean waves. It is a delightful 3 mins. beach walk to Imua Coffee Roasters and the Coconut Marketplace for shopping and grocery basics. Driving into Kapaa for a wide selection of restaurants, a leisurely stroll to window shop or Safeway, Foodland, Long’s also minutes away. One night we enjoyed The Smith Family Garden Luau - 5 mins drive. On days we ventured further it was super easy acess to many of the incredible treasures that Kauai has to offer. Lina we appreciate your welcoming, easy and efficient communication. Mahalo for helping us experience “Live aloha. Stay pono”! We are dreaming of our return visit to Lae Nani. Facility was beautiful. Our condo looked out over manicured grounds and the pool to the beach, which wasn’t more than 50 yards away. It is centrally located and restraints and shopping are close. Highly recommend! Everything was as advertised. Owner and local property manager were both very responsive. Excellent view. Nice complex. Decor and kitchen are a bit dated, but well maintained. We found this condo to be very much as advertised and more, an extremely clean, conscious, tastefully decorated home with everything you need in all the right places, and just generally a delightful place to hang out. Because the unit is on the top floor it gets great light and the view from the living areas is spectacular. Beach towels, a small ice chest and a few beach accessories were provided. The location on the island and adjacent beach are excellent. The grounds are well-maintained. The pool was large and clear and never overused even on a full-occupancy Christmas week. We enjoyed use of the property's Weber gas grills on a couple of occasions. The owner was very responsive, welcoming and great to deal with through email. Our 5 precious nights went far too quickly and it was very difficult leaving for the last time. Lae Nani was the perfect place to stay while visiting Kauai. I had my two young children and while I probably shouldn't have picked the 3rd floor because I had to truck the kids and all their stuff up and down all the stairs....it really didn't matter in the end because the condo was perfect and fit our needs very nicely. It felt very spacious and it had a great view of the pool and ocean from the lanai. It was very clean and well maintained. It had everything we needed to start our trip off smoothly. I've already talked to my extended family about renting again at Lae Nani and trying to get a large group of us to go and rent out several of the condos at the same time. It was quiet and peaceful and very much enjoyable for our week long stay. Wish we could have stayed longer!!! Thank you for having us!!! Not only were the ocean front views amazing the condo was super clean and comfortable. Kitchen stocked with all basic supplies needed. 2 bathrooms was very nice. Updated master bath. Bed was super comfortable and ceiling fan kept us very comfortable along with full length windows to let the tradewinds flow through the condo. Very quiet and very comfortable home away from home. Great location, walk to wednesday market as well as fine dining. Close to airport and shops and anything you might want. Would stay here again. Tennis court can also accommodate pickle ball. Free Parking. Free wireless internet. No resort fees! Contact owner for exact quote and other possible discounts.